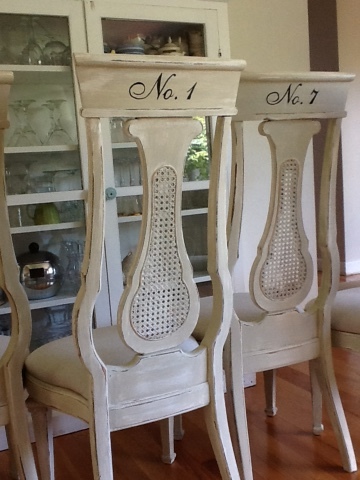 I had found these old unwanted dining chairs and wanted to try and do something really unique with them. I cleaned them, took off the old disgusting fabric and went to work. 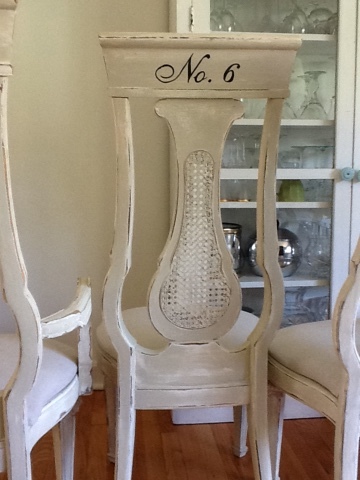 I mixed up some homemade chalk paint by using plaster of Paris and a little water and adding it to the paint. 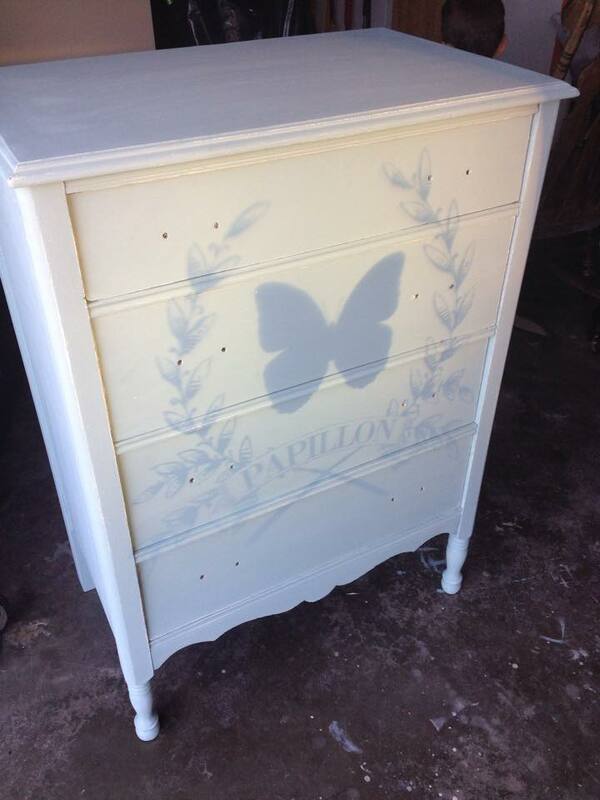 This was just a white paint that I had lying around from another project. 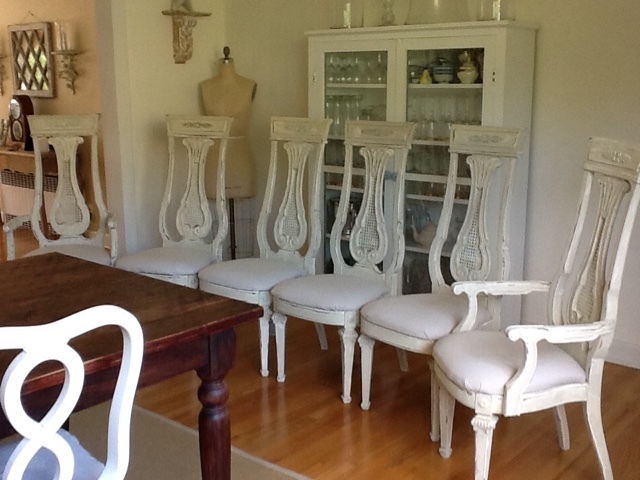 The before…the lines were great on these chairs, I knew the caning would look amazing painted. 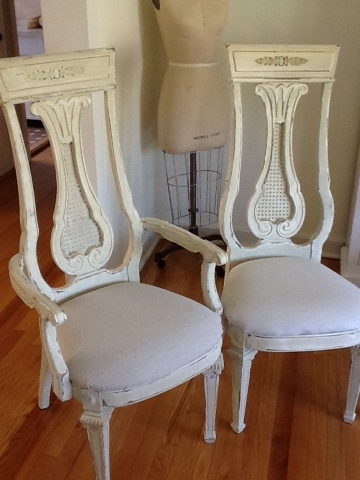 After painting them white, I dry brushed a light gray over them to give the, a timeworn, antique French feel. Then, using my sander I went to town on sanding all the edges. I went on my computer and printed out the numbers and letters in the font that I liked, then I used a craypas crayon to color the back of the paper giving me in essence a carbon copy. Then I taped the image onto the area I wanted and traced with a red ball point pen. 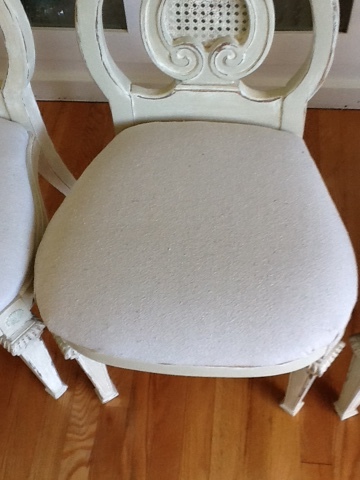 This lets the color from the craypas show through on to the chair. Then I took black paint and I filled in the tracing! Every chair had a different number. 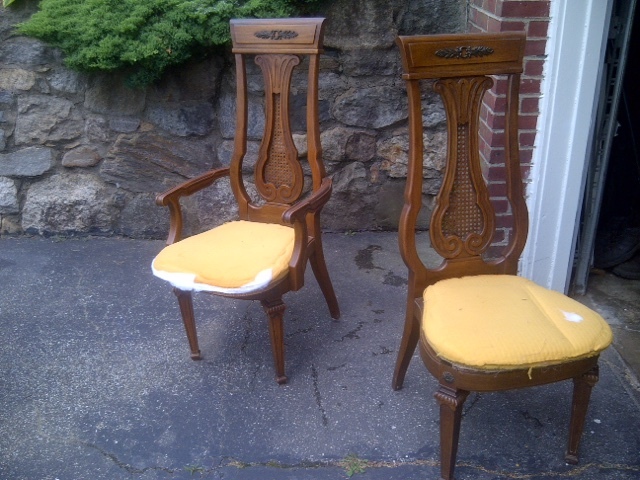 When the chairs were all complete I waxed them with Johnson’s paste wax and buffed them to give them protection. 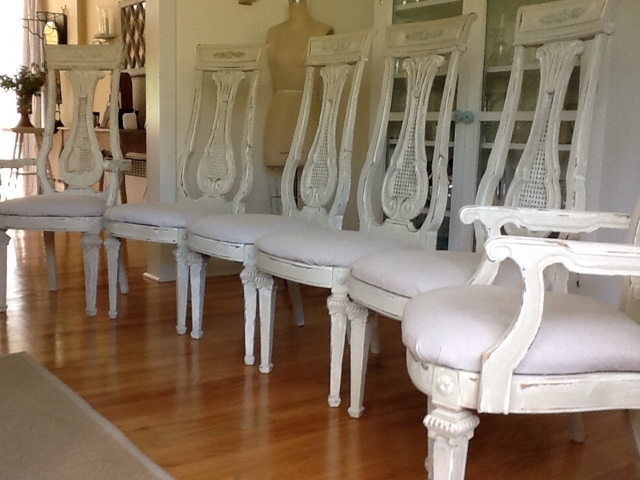 I finally covered the chairs with drop cloth that I had prewashed. 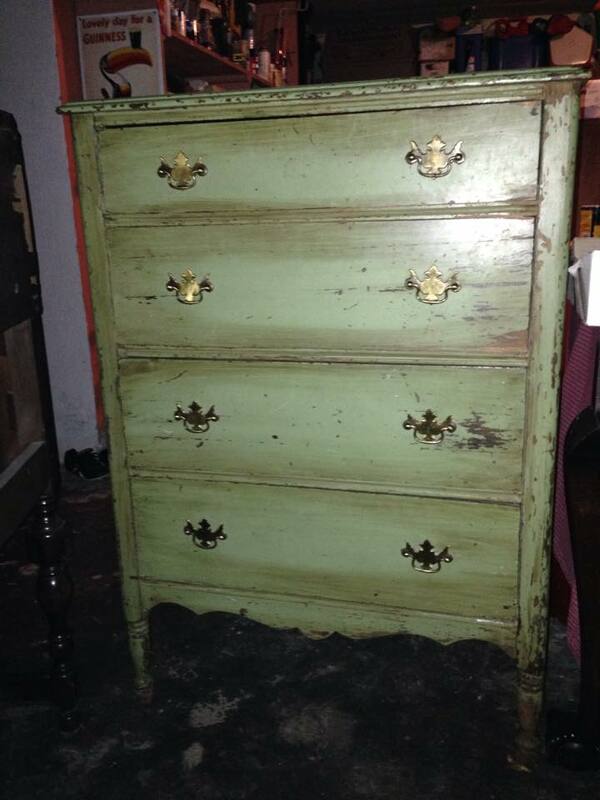 So this is the before….a tired looking green painted maple dresser I picked up at a garage sale for a song. I decided to use a graphic from The Graphics Fairy website and go to town! 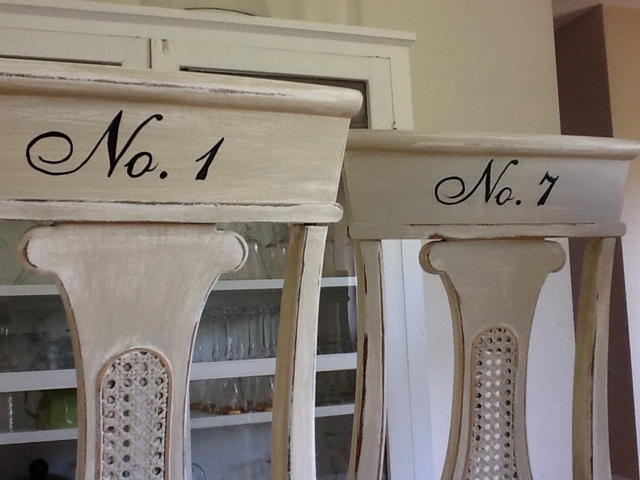 I used an antique white chalk paint first and then mixed up a custom glaze in a mocha brown. I dry brushed it on and then distressed the whole piece. The top I sanded and then stained in a driftwood stain, I think it was Minwax Classic Gray. 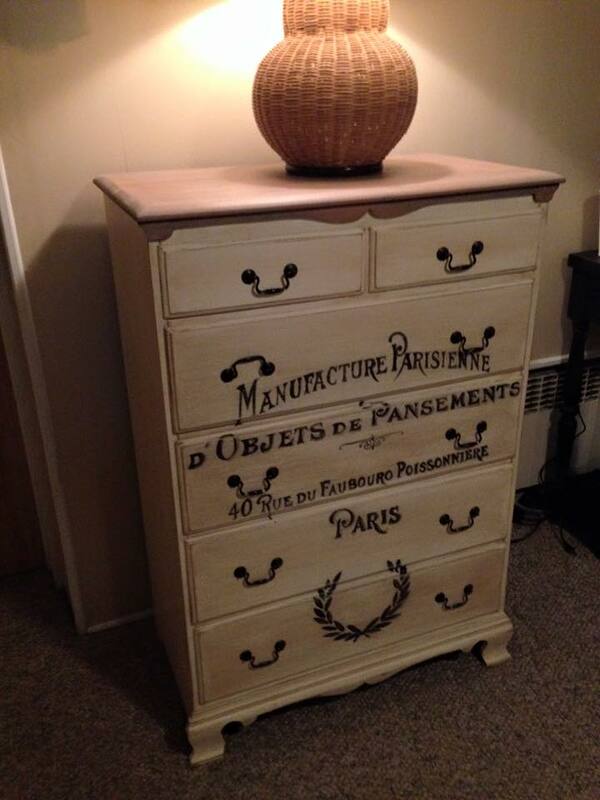 My friend gave me this old dresser that she was getting rid of and I couldn’t wait to get stared using a graphic from The Graphics Fairy!! 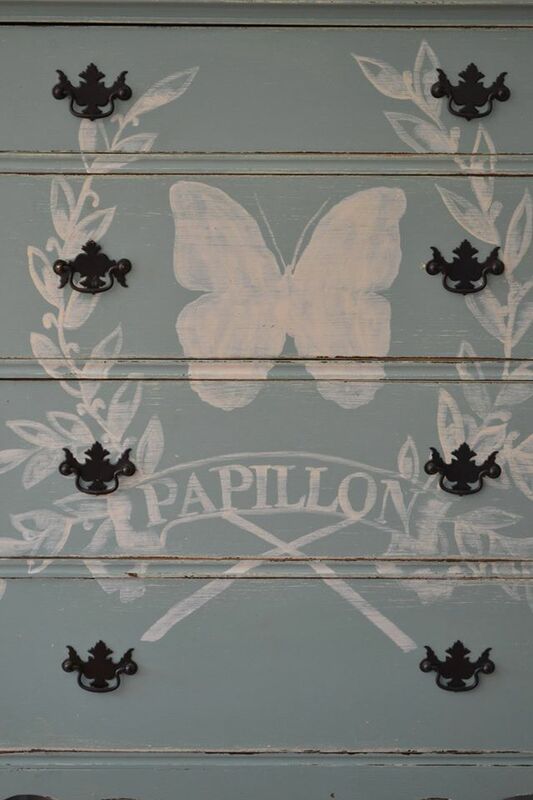 The Papillion image was so gorgeous and I knew this piece was the perfect canvas for it. I took all the hardware off and spray painted them with Rustoleum’s Oil Rubbed Bronze, my go to color for hardware these days. 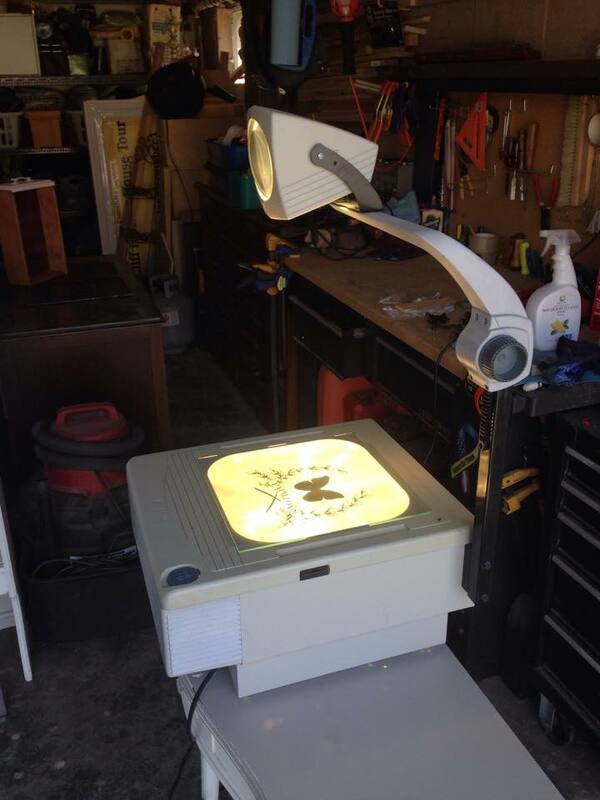 This is the image projected on to the piece. I went to Staples and made a transparency of the image. This works perfectly for me. 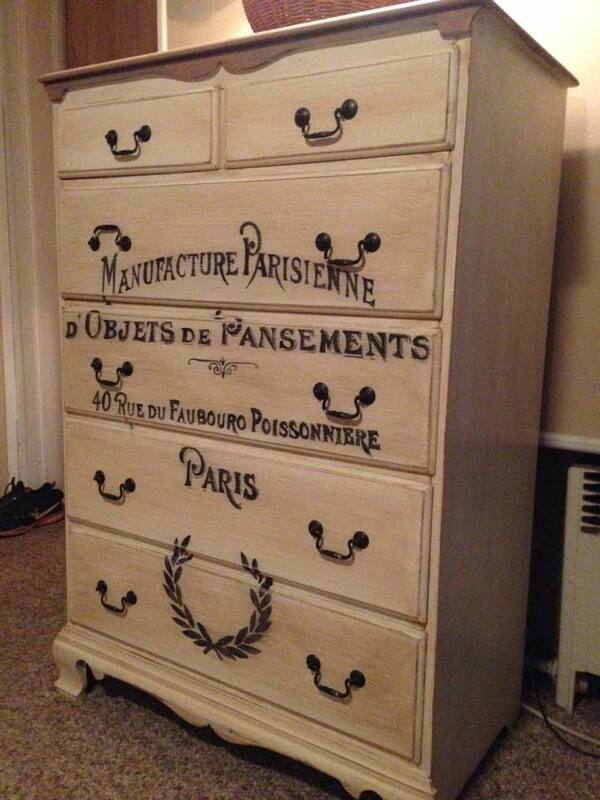 I love how I can make the image bigger or smaller depending on the piece of furniture I have. I outline the image in chalk or pencil and then using a fine brush I fill in the image. In this case, I used white paint. 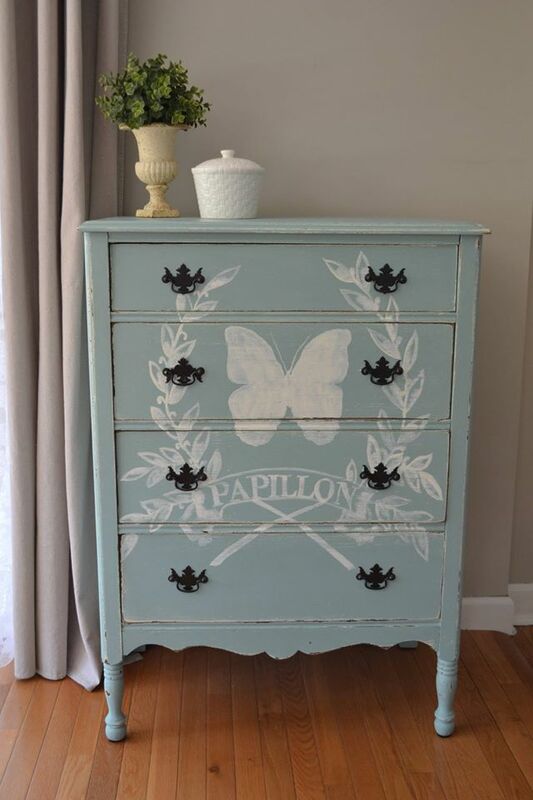 I primed the piece first , and then I mixed up my own chalk paint recipe in a Robin’s Egg Blue Color. 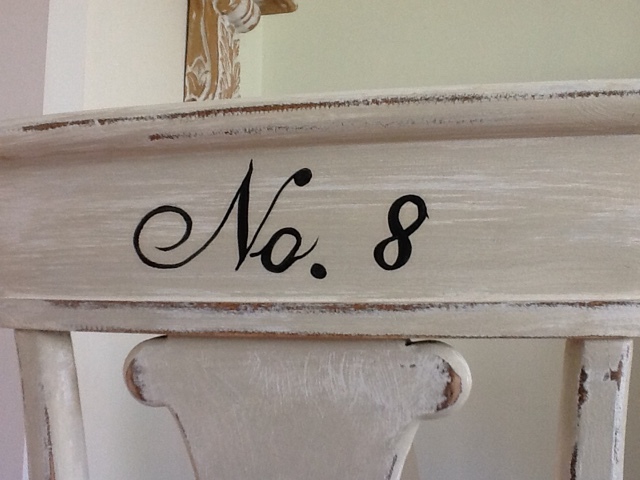 After painting the image on the piece, I lightly distressed it with a sanding sponge to give it an aged, antique feel. 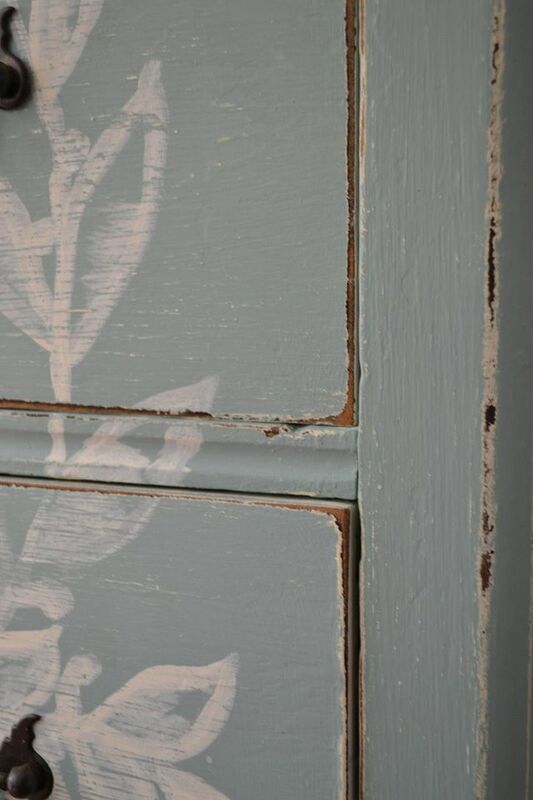 I distressed the edges which brought out some of the white primer and the green paint that was previously painted on there. I loved the effect. 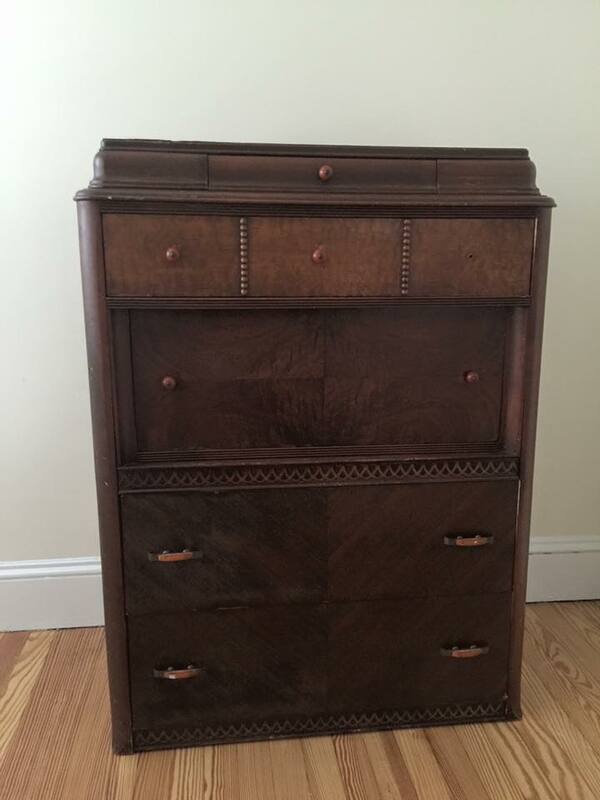 To protect and finish it, I applied Johnson’s Paste Wax to give it a nice sheen and smoothness to the dresser. I love how it came out! This was really the perfect image for this piece! Thank you again Graphics Fairy!! 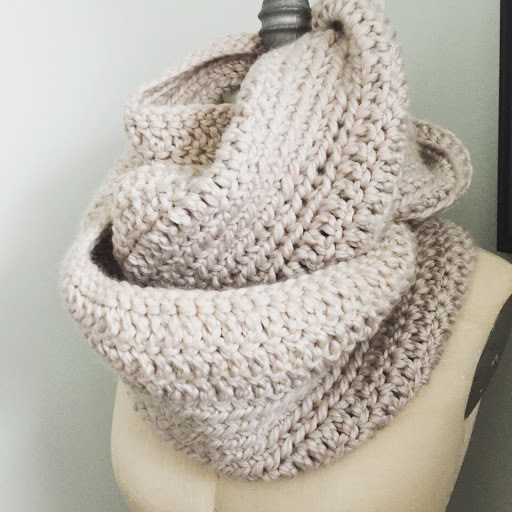 I needed something cozy for myself this winter so I came up with this ribbed stitch pattern. From Michael’s I used Loops and Threads Cozy Wool in Mushroom. 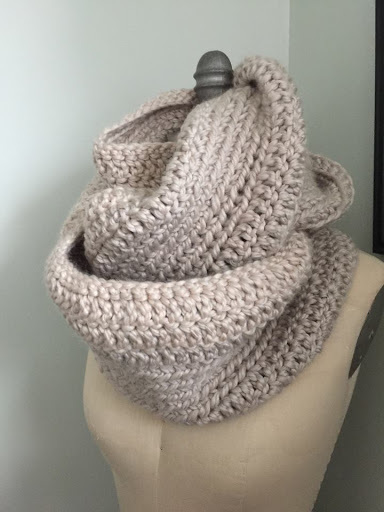 I used about 4 skeins of yarn for this one. The length was around 66″ or so. And the width was about 12″. 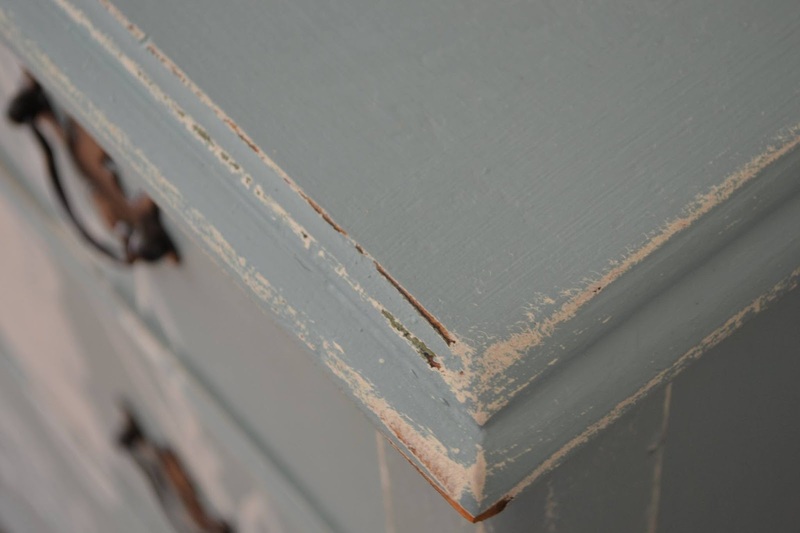 This dresser wasn’t looking so good, peeling veneer at the edges of the drawers, and a bit on the top as well. I knew I wanted to keep the beauty of the wood intact as much as possible. 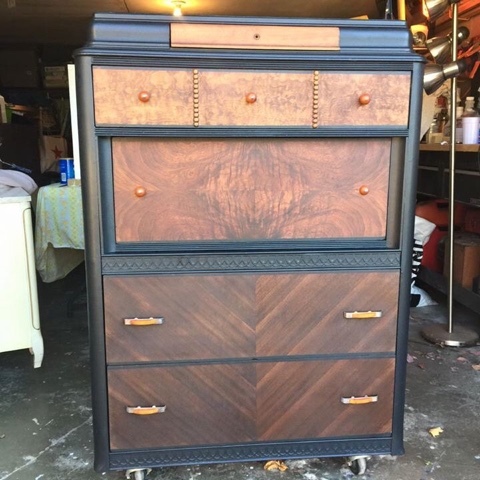 This piece not only has beautiful lines but also vintage Bakelite hardware! I decided to fill in the areas of veneer that were chipped by using Bondo. 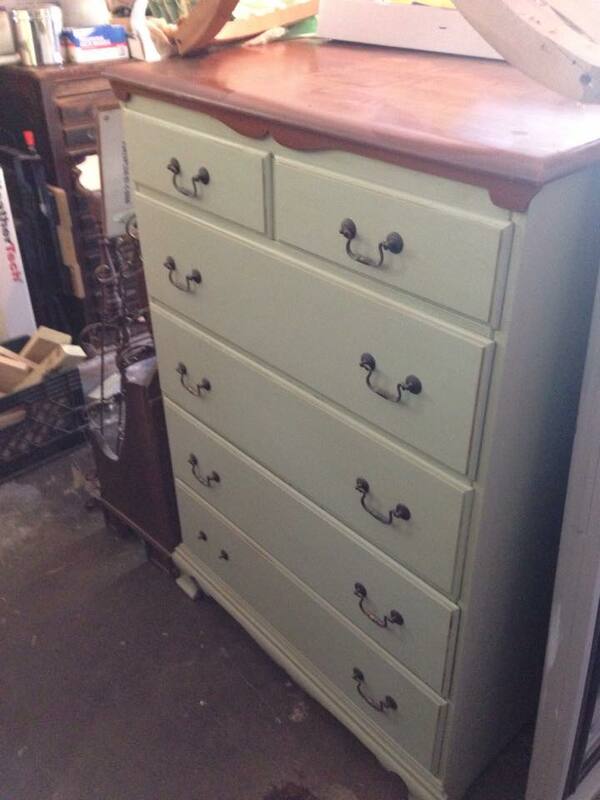 I stripped and sanded the drawers, and painted the frame Carbon a Behr color in a matte finish. 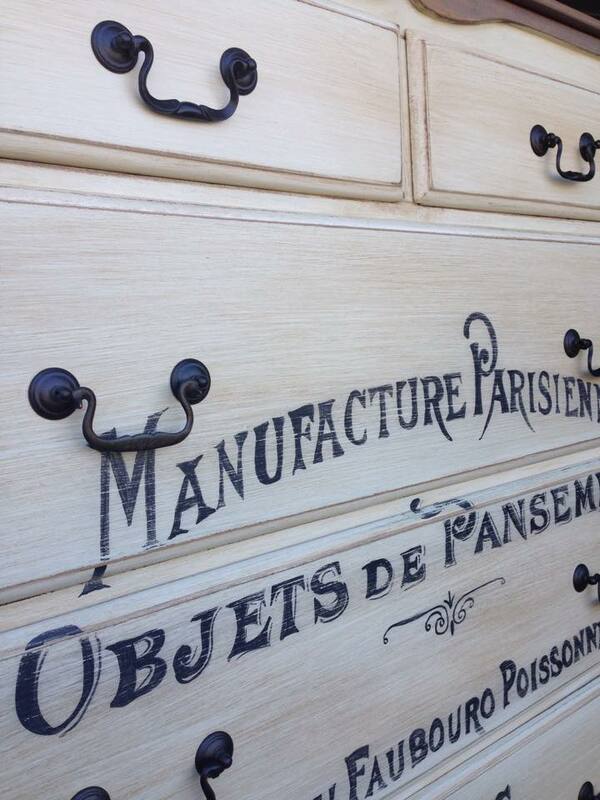 I restained the drawers in a English chestnut minwax stain. Waxed and done!